...uses design as a perspective, designed objects as evidence of larger systems, and designers as researchers. ...will be published once a year as a collection of thematic explorations and reports on topics of interest to our readers. ...is hard to describe as anything but "in flux." ...is a labor of love (/hate). Task #2 was at De Zines in Madrid. Pictures of the opening here! Task #2 is part of Fits for Prints, a pop-up store at AMP in Athens. Task will be part of Unter dem Motto on September 5, a one-day self-publishing fair in Berlin hosted by Motto Bookstore and Chert Gallery, Berlin. Task makes an appearance in the Curiosities column in Abitare 495! Task has a new blog where you can discuss selected stories from Task. Task #2 is out now. 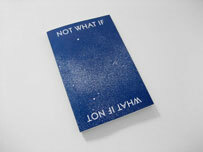 Task was featured in the self-publishing issue of Graphic magazine. Task #1 was included in the Live Archive at the New Museum as part of the exhibition The Generational: Younger than Jesus. Forms of Inquiry was recently at Casco in Utrecht. Read a response to the exhibition at Design Observer. 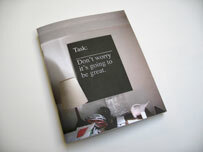 Read the Design Observer post about the first issue of Task. The complete set of posters we made for Forms of Inquiry can be dowloaded here. Task's contribution to Forms of Inquiry is featured in Idea Magazine No. 326. The Task Newsletter Issue 1 has been included in the exhibition Forms of Inquiry: The Architecture of Critical Graphic Design on view through October 31 at the Architectural Association School of Architecture, London. Task is featured in the October issue of Creative Review. Premier issue: A hodgepodge of conversations with Eric Olson, Mevis & van Deursen, and Project Projects, stories about designing Al Gore's ecobook and eating lunch in North Beach, meditations on being away from home, an incomplete reader on the question of eclecticism, and an ode to Cat Lovers Against the Bomb. The Mundane Science Fiction issue: Tone it down/pull it back. The future never gets old. Metahaven discusses online utopian impulses. Rob Giampietro and David Reinfurt have a slightly phased conversation. Kate McKinney Maddalena provides the etymology of the word "mundane." Task interviews the NASA Earth Observatory. Randy Nakamura tries to hold back his emotions. Catalogtree predicts the future. Daniel Eatock, LUST, Peter Bilak, Sean Donahue, Mr. Keedy, Zak Kyes, and Wayne Daly describe things that never happened. Paul Elliman climbs the Tower of Song. Jimmy Carter addresses alien races. Apollo 8 gets unscripted. Buckminster Fuller coins a term. Christian Bale meets Ettore Sottsass. Google organizes the world. All this in the span of a day, the palm of your hand. Read and comment on selected writings from current & past issues of Task Newsletter. Buy a classified ad in the next issue.